The holiday season is traditionally marked by baking, baking and more baking. Parties, presents, hostess gifts, and even cookie exchanges. Generally, I stick to making things from scratch but I can only do so much. That being said, I was really excited to get a copy of The Ultimate Cake Mix Cookie Book. The Ultimate Cake Mix Cookie Book is a collection of over 350 recipes that all start with a simple box of cake mix. When this book first came, I had thought that I would mark the recipes I wanted to try. I quickly abandoned that idea. They ALL looked good! Mostly favoring white, chocolate, and spice cake mixes, you can also find a handful of recipes that use yellow & other misc. flavors. 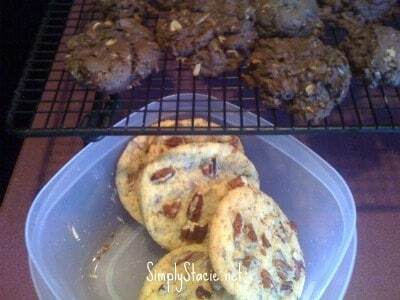 I tried two recipes over Thanksgiving week–the Praline Cookies (page 87) and the Double Chocolate Coconut cookies (page 41). One of the things I loved about these cookies are that they are EASY. Dump the mix & liquids. Stir. Fold in yummies. Bake. They use a minimum of utensils and I didn’t even need a spatula to scrape the bowl. I used a bowl, mixer, cookie scoop & a measuring cup. The cookies I made were both drop cookies & the chocolate ones were very puffy & chewy. The praline cookies were flat because of the high fat content in the butter cake mix but the notes revealed this before baking. I got fewer cookies per recipe, but I use a cookie scoop instead of spoons. Camilla Saulsbury, an award winning cook & recipe designer, has won several competitions including the Food Network $25,000 Ultimate Recipe Showdown (Cookie episode). It’s obvious that Camilla is an expert. The book starts out with a baking primer in the beginning that was hugely useful for baking in general. The book was sectioned out by cookie type — drop cookies, bar cookies, and formed/filled cookie. Ms. Salisbury includes an index of recipe by mix type, which is handy when you are trying to use up your stockpile. This is a great book for anyone who likes variety, hates cleaning up a kitchen mess, likes to spend time with kids in the kitchen, or cooks for crowds or as a ministry. You know, EVERYONE. This would be an especially useful book if you are invited to a cookie exchange this Christmas season and need something easy, plentiful and unique. Go pick up your copy today! I LOVE easy baking with minimal ingredients! Would make it so much easier baking cookies with small children too.